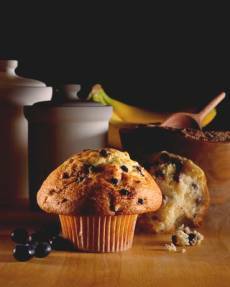 The recipe that you are using MUST have a thick batter in order to produce High-Rise muffins. Thin batters usually bake flatter muffins no matter what you do because they don't provide a strong foundation from which a muffin can puff in the oven. Fill the muffin cups almost or to the top of the rim, instead of 1/2 or 2/3's full, suggested by most recipes. You'll get fewer muffins from the batch, such as 9 muffins out of a dozen mixture, so fill the empty muffin tins half full with water so they won't smoke during baking. Do this after you place the filled muffin tins on the oven shelf. I use a small cream pitcher with a spout. To cause a batter to dome, you have to preheat the oven to 425 degrees F/220 degrees C, even though the recipe may say to use 350 or 375 degrees F. As soon as you put the muffin batter in the oven, reduce the heat to what the recipe says. The initial high heat of 425 degrees F causes the batter to have greater oven spring or the rapid rise during the first few minutes of baking. This results in a high domed muffin. The comments above are from Sarah Phillips of Baking911's Website. The recipe below is NOT Sarah Phillips recipe and I am sorry if there was some confusion about this. 1. Preheat oven to 425 degrees F/220 degrees C (you will reduce the oven temperature to 375 degrees F/190 degrees C when you put muffins into bake). Grease and flour a 12-cup muffin tin or line with paper liners. 2. Combine 1 1/2 cups flour, baking soda, baking powder and salt in a medium bowl; make a well in the center. 5. Fill prepared muffin cups almost to the top of rims. Place muffin pan in oven and immediately reduce oven temperature to 375 degrees F/190 degrees C. Bake for 18 to 20 minutes or until muffins test done. Cool in pan on wire rack. Excellent recipe! Very easy and taste great. I only managed to make 9 with the recipe and not quite as high rise as the picture, but still really good. This is not a recipe by Sarah Phillips at baking911.com. The advice has been taken from the website, but not the recipe, which I have had a few complaints about. I modified the recipe according to what I had in the kitchen and it turned out beautifully. 1 1/2 cups spelt, 2 large bananas, 1/2 cup berry sugar + 1/2 cup walnuts as well as the cup of blueberries. I tried this recipe. There was no liquid added to it... Why? I asked family friend, food technologist Julie Finnin, who got us to add milk... It turned out fine. But not nearly as tasty as I was hoping for. Really not great... Sorry. Good advice on how to make a taller muffin, but a very bland recipe. I added lemon zest and cinnamon and it was better. These are delicious. I loved them. They tasted great, although they were quite oily and did not rise as much as I would have liked. I added cinnamon, vanilla essence, and cranberries in to make up for not having any bananas. What is the recipe they use in shops to get the HUGE muffins? Excellent muffins, they were great even though they did not rise as much as the picture above. I prefer things very potent, so I imagine that in making these muffins again (which I plan on doing today!) I would use some cinnamon, perhaps a little vanilla. I'm noticing that there were several negative reviews of this recipe after posters had ALTERED the recipe... If you're reviewing an altered recipe, you're reviewing YOUR recipe NOT THE RECIPE LISTED HERE. Please people, give accurate reviews on the actual recipe - it helps us all. The 1/3 cup of butter is a no no! Can I substitute a plant based fat? Thanks. Excellent result and great tasting muffins, an instant hit with my kids! I read somewhere that baking powder looses its strength if too old. After checking the date on the jar I found it was out of date by more than 2 years. I didn't have any soda at home so I just compensated by adding a third tb of baking powder. Wow, they rose exceptionally high. Followed the rest of the recipe exactly. Thanks! Easy, simple recipe that produced only nine but good sized, puffy topped muffins... I added a sprinkle of organic brown sugar on top for a fantastic crunchy surprise.